After adding a new rank type a new menu will appear in your admin area named Ranks. 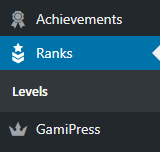 Inside the ranks menu will appear new sub menus with each rank type registered to let you manage the ranks similar to WordPress default posts or pages. On the rank edit screen you have the Rank Data box that includes some useful options to configure the way an rank can be achieve. 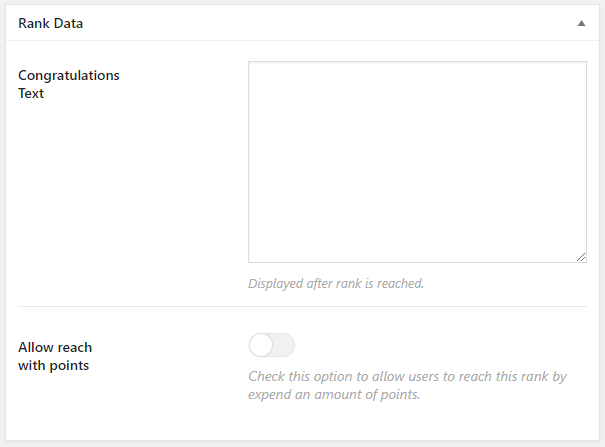 Checking this option will force users to complete the rank requirements in order. Since 1.4.6, this field has been moved to the required requirements box. Checking this option will add a list of users who have earned this rank on the rank single view. The text displayed after rank is earned. Checking this option will allow users to unlock this rank by expend an amount of points. Amount of points needed to optionally unlock this rank by expending them. Points type of points required to unlock this rank by expending them (optional). For each rank you create you can configure an unlimited number of requirements to be considered an user can reach the rank. For more information about how this requirements work visit this page. On the rank edit screen you have the Rank Details box that includes a field named priority. 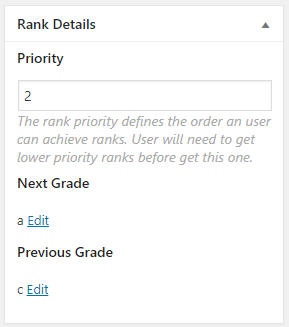 The rank priority defines the order an user needs to follow to being earning each rank. Every time you configure a new rank type, all users will get by default the rank with the lowest priority, so user just will be able to achieve the requirements of the next rank. On the rank edit screen you have the Rank Template box that will let you to configure options on the rank single view. Checking this option will add a list of users who have reached this rank on the rank single view. 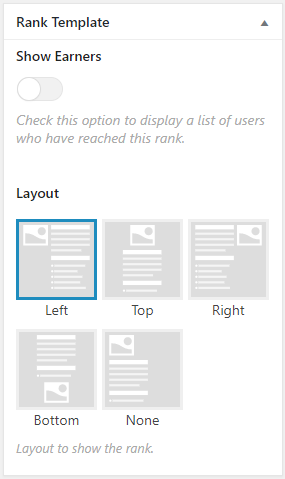 Layout to use on the rank single view.